1-1/2” colored panel nails (over drywall). Subfloor adhesive may also be used. Before you install cedar planks, remove the planks from their packages and place them in the area where they will be installed. Allow the pieces to acclimate for a minimum of 24 hours prior to installation. Like all wood, cedar will expand and contract as its moisture content changes. This waiting period allows for this process and helps prevent warping or gaps after the closet is completed. Measure the surface you wish to cover to determine square footage needed. Measure the width and height of each wall of the closet. 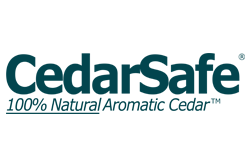 Then use our closet planner application to determine how many boxes of CedarSafe solid cedar planks you will need. Lay out the planks in the order in which they will be installed, staggering the ends for a random appearance. Set aside a few knot-free pieces to fill in gaps. NOTE: Although cedar planks can be applied vertically, diagonally or horizontally, horizontal installation is recommended for most do-it-yourselfers. NOTE: BE SURE THE FIRST ROW IS LEVEL. Nail at stud mark directly through the face of the plank, using 1-1/2″ panel nails if going through gypsum wallboard and 1″ nails if installing directly over studs. In older homes with plaster and lath, use 2″ nails. NOTE: Adhesive is recommended if planks are being installed vertically. If you choose to use adhesive, subfloor adhesive is recommended, because it will provide a solid bond that will not be weakened by the natural cedar oil present in the planks. Using subfloor adhesive: apply along stud lines and at top and bottom of plank. Be sure to read and follow the manufacturer’s safety and ventilation instructions when using adhesives. Once the first piece is in place, continue that row across the length of the wall. To finish the row, saw one piece to make a perfect fit. Use the remainder of that piece to start the next row. Continue until the entire wall is covered. Completely line one wall before starting another. Cut the pieces that were set aside to fill in gaps along the floor base, corners or ceiling – or install mouldings for a professional finish. When working around doorways, run the planks all the way up to the trim. Cutting and fitting is usually required above doorways also. NOTE: After completing four walls, you will have gained skill at cutting and fitting. Put this skill to use in finishing your ceiling, floor and the back of the closet door for complete seasonal storage. Install molding for a professional finish. NOTE: Do not stain or varnish. Have you found a unique way to use your planking that we should know about? What about a helpful installation tip? Show the world! Contact us today to show us what you did!